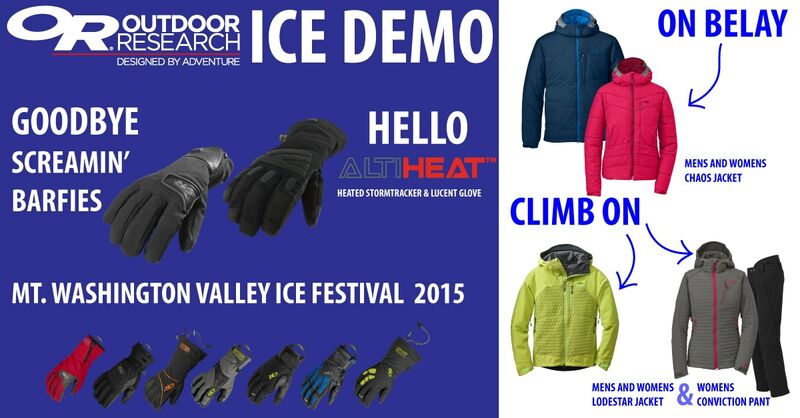 Our headlining sponsor, Outdoor Research will be bringing a huge fleet of demo gear for Ice Festers to try! Not sure what gloves fit you best? Outdoor Research will have plenty to choose from including the heated Stormtracker and Lucent Gloves! These gloves use ALTIHeat™, a rechargeable battery-powered heating system that provides staying power when you’re determined to be on the mountain from first chair to last call! So say goodbye to the screaming barfies because these gloves will keep your hands warm at any temperature! Also available for demo will be the Mens and Womens Chaos Jacket. This synthetic puffy is Outdoor Research’s most versatile layer. It is the warmest, lightest, and most packable synthetic parka that is tailored for athletic movement. The mens and women Lodestar Jacket and the women Conviction Pants will also be available! Get there early because these items will go fast! Dry Ice Tools will be back at Ice Fest! If you are like us, you love to both ice and mixed climb but feel unprepared when the ice starts forming ever November. Hitting the gym with a pair of DRY ICE Tools before and during the season, in addition to being tremendous fun, is a fantastic way to train specifically for the unique movements and strains of our sport. With the Dry Ice Tools, one can prepare at any time for an alpine trip that has been on the books for months or keep their fitness up in anticipation of that ephemeral once-in-a-decade grade VI ice line coming in. 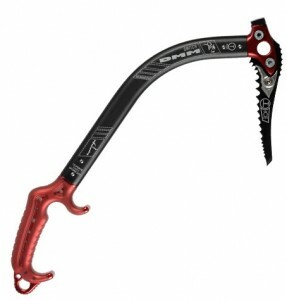 The design is simple and super smart: they have an ergonomic handle that mimics the shaft of an ice axe with a loop of stiff rubber that can be hooked over the existing climbing holds at any gym. 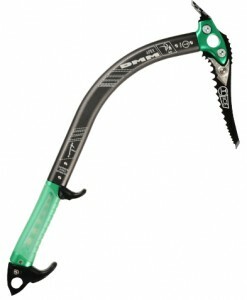 The movement is as close as you can get to mixed climbing and ice climbing, without the danger of a sharp metal point. 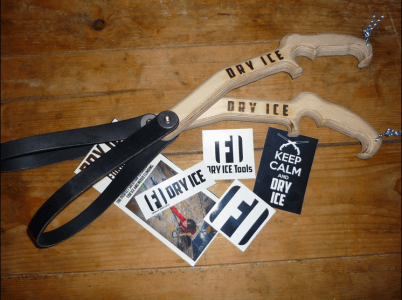 These tools make for a good time and a much better start to your ice season! DRY ICE Tools are popping up everywhere and an increasing number of hard-hitting ice climbers are training with them. 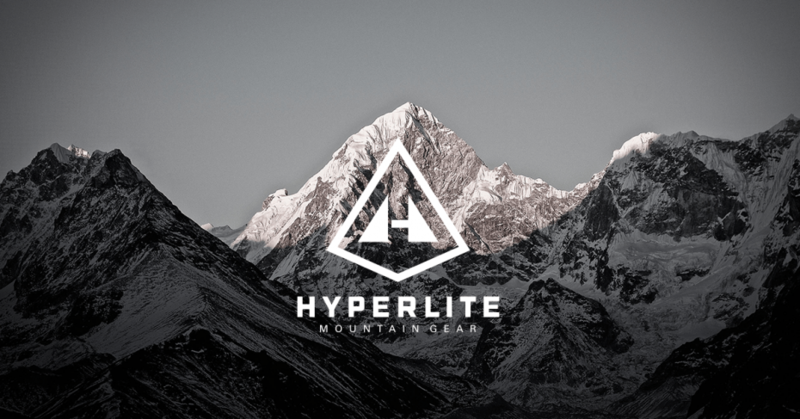 We are psyched to announce that YOU will be able to test these bad boys out for yourself at Ice Fest this year. We think you will be pleasantly surprised by how easy they are to get used to and by how well they simulate the movement of climbing real ice. DMM will be at Ice Fest 2015! The Mount Washington Valley Ice Fest is thrilled to announce that DMM will be a sponsor for the first time. In addition to giving away schwag and laying out a diverse array of the company’s innovative gear, DMM will also be bringing along an arsenal of demo tools made, like everything at DMM, in Wales for ice-festers to try out. One of the demo tools, the Apex, is incredibly versatile, equally at home on long moderate routes in Huntington’s as it is climbing the imposing pillar on Remission. Another demo option, the Switch, is a more aggressive tool that would also perform well on vertical ice but thrives on steep mixed lines like Dierdre. In addition to supplying a generous lineup of hardware, DMM will also be sending along athlete Dave Garry. If anyone could speak authoritatively on how to get the most out of DMM tools, it would be Dave. Having already put up two new mixed routes in Chamonix this season, Dave is on a roll and the staff here at the Mount Washington Valley Ice Fest are delighted to have him at the event. Two years ago DMM athlete Nick Bullock came to ice fest and, after giving one of the funniest slide shows to date, fired many of the hardest ice and mixed lines that the North Country had to offer using the Switch – establishing DMM axes as well suited to New England climbing. At ice fest this year, we are incredibly excited to finally be able to try out these two lightweight, well-constructed Welsh tools for ourselves. Merry Christmas Eve everybody! We hope this post finds you well. Today we’re here to welcome Scarpa back for 2014! We’re psyched to have their support and to give them a little love today. 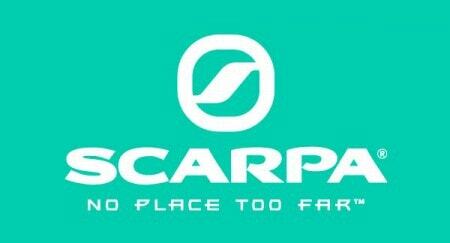 Scarpa has been around since 1938 where they started as a small family business based in Northern Italy. Since then they’ve grown to be recognized world wide, all while staying true to their family roots. They specialize in performance footwear and the tradition and innovation that goes into their products is the stuff that keep you going. Scarpa will have a table set up at Ice Fest this year with a number of different boots for you to demo! 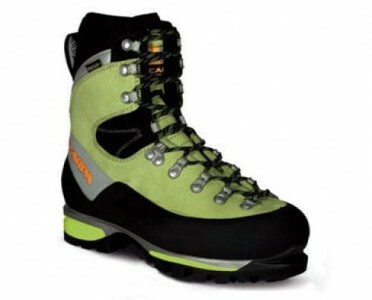 Their most popular pair in both Men’s and Women’s is the Mont Blanc GTX. Self described as the ultimate all around mountain boot, these boots absorb shock and support your feet in ways you didn’t even know they needed to be supported. All while keeping them warm and you moving with Goretex on top and Vibram on the bottom. This is definitely the boot you want to have on your foot when you’re out there trying your hardest. Make sure you stop by their table to try these and the other boots they’ll have to offer this year!